McKeen's Hockey took a look at the college-bound players that led the Stouffville Spirit to the third round of the OPJHL playoffs in the North Conference. McKeen's correspondent David Burstyn was particularly effusive in his asssessment of Corey Trivino who is currently ranked No. 17 on McKeen's Midterm Rankings for the 2008 NHL Entry Draft. 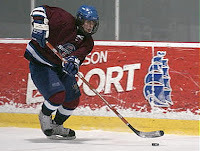 Corey Trivino (2008), C, Stouffville, Committed to Boston University. Trivino led the team in points in the postseason, as he took his game to another level .. he has been a member of every International team he went to training camp for, including the Under 17 team and the World Junior A Challenge .. an offensive-minded centre whose skill marries well with his feet .. he does everything in mach speed, as his hands and feet work in unison with one another .. he can control the pace of the game when he enters the offensive zone, as he shrewdly weaves his way in and out of scoring areas .. his passing skills are superior to anyone in the OPJHL .. his ability to make plays in traffic and find the open man is awe inspiring .. he literally dances around the opposition and is a wizard with the puck .. goes to the net with his stick down, always prepared .. showed more attention to detail away from the puck in the playoffs ..he engaged in the corners and behind the net for the puck and is a gifted soccer player, as he often used his feet to alleviate pressure .. his forte is creating offence, however he needs to shoot more .. he is tricky to get a read on but has developed more of a reputation as a passer .. has all the tools to be a player, however his weight is a serious concern .. while it is not inconceivable for him to add some weight, some NHL teams might be scared off, as many prospects weigh more than his listed 160 pounds .. because of his slender frame, he does get pushed around in the slot but to his defense, he comes back, often eluding coverage much like Mike Bossy did in his NHL career .. given his gifted offensive imagination and skills, Trivino should see himself land in the bottom half of the first round, as his game is a mirror image to that of Mike Ribeiro. controlled the game at the half boards making timely passes .. at times, he looked lost and struggled to identify the changes in the game. particularly in the Aurora series, as he did not adjust to the Tigers neutral zone trap .. his strength is a major concern as well .. he gets pushed around too often, however at 16, he is not supposed to bulldoze over the opposition .. nonetheless, he is very ineffective along the boards .. plays a wide-open game, curling and dragging the puck to get into better position .. Werek played out of position for the most part of the playoffs and season and it showed in his game .. a natural centre, he rode shotgun to Trivino on the left-hand side .. while this helped to pad the points, it also crippled his development somewhat .. should continue to be a major point producer next season and will undoubtedly be a player who is mentioned in the NHL entry draft. 2008 recruit Ryan Ruikka's hometown newspaper traces his path from local star in Chelsea, Michigan, to EJHL champion with the Jersey Hitmen.